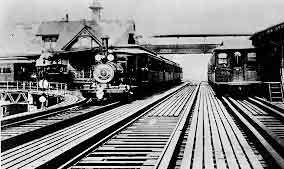 From the early 1870s until 1903, Manhattan's elevated trains were powered by small steam locomotives. 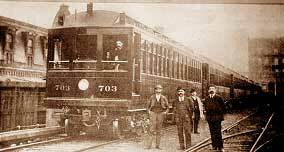 On November 21, 1900, multiple-unit, electric-powered trains were tested on the 34th Street Shuttle. Car 703 headed the test train. By April, 1903 all Manhattan elevated lines were electrified. The late 1950s scene (at left) is at the junction of Myrtle and Wyckoff Avenues at the Queens-Brooklyn border. 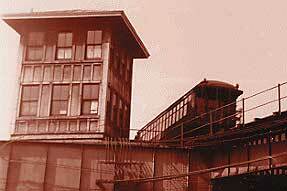 The Myrtle Avenue El was the last rapid transit line in North America to use open gate cars.